I think I know the problem NOW. Having followed some of the 'too simple' advice on other forums, I replaced some electrolytic caps on power supply and main board although I didn't really believe that was the problem. All to no avail. Meter readings before and after all ok etc. With some divergence I found what appears to be a related problem with an LG LCD TV where one of its BGA chips 'failed' preventing tv from powering on. Temporary (as it turned out) solution was to try and re-flow solder the particular BGA chip. This would make the tv work for some weeks before the original problem returned. Tried this a couple of times with same result but gave it away (to the local tip) in the end. Now I have confirmed that there is same/similar problem with the chip with the glued on heatsink (that I haven't been able to remove) in my 2400. Having received the spare/refurbished 2400 and nothing to lose I tried the same BGA solder re-flow attempt. Oven thermometer against heatsink, apply heat from (paint stripper) heat gun to around 200deg C and leave to cool. Bingo, all working as normal and continued for nearly a month when started getting the "Service scrambled" message just before Easter although all previously recorded programs still available and play normally. So, not a power supply or tuner problem but a logic decoding issue with a failing chip. Had another re-flow attempt but reluctant to try and prise off the glued on heat sink so just ran up the temp a few more degrees. Nothing else touched. Let chip cool down then powered up and all fully functioning again. Probably won't be a permanent fix as there appear to be known issues with the longevity/reliability of the assembly process with some BGA devices. Once the problem arises after a few or many years, unless the chip can be 'removed/replaced it's unlikely that the DIY solder re-flow will provide a lasting solution. At least the power supply and HDD together with recordings are ok. There's a mountain of info on the BGA topic on the web. I have had this problem from time to time, but it was never a permanent issue. I do not recall the issue having been traced back to power supply or loose CAPs. I assume you are familiar with the discussion of this issue on the oztoppy wiki. The Toppy assembled in Indonesia is likely to be a more recent one, with an updated main board and power supply. The most recent main board for a 2400/2460 I am aware of is TRF-2400 Rev 2.1; both mine are 1.2 if I recall correctly. The main board for the 5300/5310/5320 is I suspect a varient of the 2400 main board, without the eSATA, analouge input and component output. Never got aroud to opening the one I was sent by Toppro so I do not have that information handy. Thanks Ian. Yes, noted discussion on the oztoppy wiki. Also posted copy on the 'old' Topfield (https://topfield.forumchitchat.com) site. How long before it 'goes'? My understanding is that the Topfield Australia forum will disappear in the next month or so. I offered to buy it from the liquidator but apprarently it was all too hard to work out. At least I have full control of this Forum, and as long as users are posting I am willing to pay to keep it going. Cannot remember how much it costs but it is not outragous. And it is too small to justify putting a membership fee on this Forum, or even collecting donations. Thanks 0ldtimer, can you point me to the location of this BGA? It's the chip with the ally heatsink. I was just given a TRF2460 a few days ago. On power up from cold or standby power up it often would give the scrambled message and after some variable time (1 to 10 minutes) it would start decoding. This seems to be a problem in the signal path so I looked for dry solder joints (found none) and ignored the electrolytic capacitors (supply filtering/stability). There are lots of SM capacitors around the BGA chip with the heatsink but its hard to believe they would fail. I've seen a few articles suggesting to try and reflow the solder to this BGA chip. I lined the fins with aluminium foil and then applied heat directly to the lining with a micro torch for 2 minutes (no idea how hot everything got). The unit still powered on and the tuners were working. I then put the whole thing in the freezer (for maximum thermal cycling - expansion/contraction). When frozen the unit still powered on and the tuners were working. Been cycling for most of the day power off or standby to on. No sign of any scrambling so far. I don't think its a solder issue as there are to many topfield PVR's that fail in this peculiar way. Thus more likely an internal issue with these chips. Wild speculation, a broken internal connection that somehow becomes bridged maybe by capacitive coupling or thermal movement. Meaning, not at all convinced anything has been resolved. This issue is common with Toppys. After much stuffing around I think it has been concluded that it is a firmware related issue - there is an extensive discussion on the oztoppy wiki. I have not seen it for a long time. When searching for this issue I did come across that oztoppy wiki. The one case of "service not running or scrambled" that the wiki does not cover is: when this message occurs on power up (from cold or standby). 1) re-flashed this unit with the latest firmware just to see if it would make a difference: it does not. 2) check signal strength and quality: excellent in my case. 3) check signal saturation issues by attenuation: made no difference (but signal strength & quality bars do respond accordingly). No doubt, signal strength issues, broadcast issues or firmware lag can result in this message popping up. But in this case it is probably a hardware issue where the signal fails to be processed. 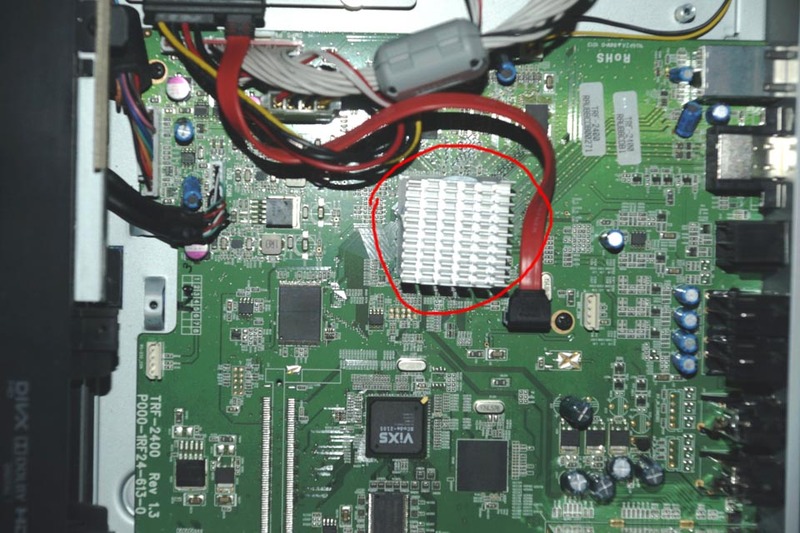 I am surmising that the BGA chip (biggest chip with the heat sink on top!) is where the video signal is being processed. Poor solder connections under this chip may attenuate or drain the signal for processing, or the chip may not function properly. Others have tried to reflow the solder connections to this chip in case any have failed, with limited results. Since the reflow attempt with the micro torch (I know "brute force") the 2460 has been cycled tens of times, left running for hours and been frozen in my freezer twice. All that just to see if I could break it again: so far its still working. A PVR with this symptom may well spring into life after leaving it running for some time. Possibly due to the BGA chip heating up and expanding the surrounds slightly which in turn puts pressure on the faulty solder joint. All the above are just my thoughts as I am not in this discipline. AQUAR, I also have this problem and been living with it. I attributed it to a "cold tuner" problem since it affects one tuner. It takes about 15 minutes to warm up, less on hot days and more on cold ones. I now just pad my recording by 30 minutes. Not ideal, but it's as good as I can get it without repairing. Heating up the heatsink on this BGA chip to a high temperature is going to be a risk. If padding is working for you then its a fine work around until it fails completely. If you try it in the future do be careful to not shift the position of the BGA chip. Meaning: during the whole heating process don't rest anything on it or against it (like a soldering iron!) and don't touch it. Hence the use of hot air or micro torch. Thanks for the tip. I might try it one day when I'm prepared to bin it. The unit has failed again after a few power cycles. I suspect the solder under the BGA chip is lacking flux and so just forms a dry solder joints during the reflow exercise. I will try to wick in some liquid flux under the chip and retry the process. Probably easier to buy a MB off the guys posting on here,(fixmydata), i just got a new 2400,earlier revision,Board off them and it working OK. I placed it in a refurbished 2400 i purchased off Topfields Ebay shop shortly before they closed,the Unit looked near brand new,plastic still on face panel etc and spotless inside,however,about once or twice a week it reboots itself,useless as any Rec. in progress stops. I fitted the new MB a couple of weeks ago and it hasn't missed a beat since so obviously a component on the old MB randomly stops working,probably why it was returned in the first place and Topfield has missed fixing it. I am just experimenting to see what happens when I "play around" with this dysfunctional toppy. I actually have other working toppies and a homecast so there is no immediate need to fix this one. Especially as this toppie also needs a new HD (as the original owner wants to keep the 1TB). Interestingly the HD in it also has CRC errors on it (smarts will tell if the HDD is failing as well!). Also I did not notice a 2460 Main Board on the list provided by fixmydata. Would not mind knowing the price of one though.